Black widow spiders are one of the most often recognized spiders because of their characteristic red hour-glass shape on the underside of their abdomen and their venomous bite. 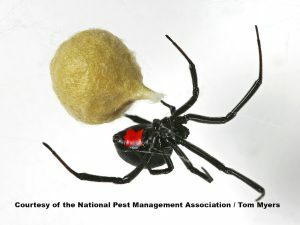 Female black widows are more aggressive than their male counterparts and more likely to bite, especially when defending eggs. Black widow spiders prefer to hide in dark, dry, undisturbed interior locations such as inaccessible garage corners and storage boxes and dark exterior locations such as beneath patio furniture, wood piles, under barbecues, etc. Black widow spiders are most active at night in temperatures that are at least 70 degrees and build odd-shaped webs, often close to the ground. It is best to act quickly and seek out a pest control expert to set up a black widow spider service if you find black widow spiders or black widow spider eggs in your yard or garage, especially if you have small children. Black widow egg sacs are light in color and identifiable by their papery thin material with each sac containing between 300-900 eggs. According to Live Science Black Widow Spider Facts, the venom of a black widow spider is “15 times stronger than a rattlesnake”. Very young children and the elderly are most susceptible to a black widow spider bite. If you already have an established black widow spider infestation on your property, it is advised to schedule a black widow spider service and then stay on top of black widow spider prevention practices. The general pest control service provided by AmeriGuard Pest Defense includes black widow spiders as a target pest.